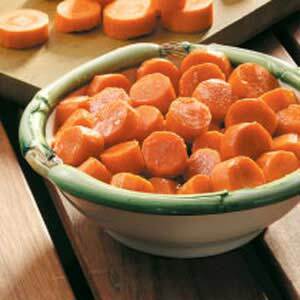 These glossy carrots have a hint of citrus and a touch of cinnamon and ginger. This dish is pretty enough for a special meal and savory for the whole crowd. In a small saucepan, melt butter over medium heat. Stir in the brown sugar, orange juice, salt, ginger, and cinnamon. Add the carrots. Cook for about 20-25 minutes or until tender, stirring occasionally. Note: I always double this recipe for the holidays. Otherwise it is just enough for our family of six on a normal family dinner night.